New York Democratic Congressman Charles B. Rangel has been in the news recently over alleged ethics violations and his Universal National Service Bill, which - if enacted would reinstate a compulsory military draft, or alternative national service, during times of war, for men and women, aged 18 to 42, who are citizens or permanent residents of the United States. The Bill is actually an anti War stunt. Rangel reasons that if all Americans were liable for service, public pressure to end the wars in Iraq and Afghanistan would become overwhelming. This is consistent with Rangel's long history with the peace movement and the far left in general. After earning a Bronze Star and Purple Heart in the Korean War, Rangel earned a law degree, before moving on to a political career. In 1961, Attorney General Robert Kennedy appointed Rangel assistant U.S. attorney for the Southern District of New York. In 1967, Rangel won election to the New York State Assembly, and in 1971 he ran against the famous Reverend Adam Clayton Powell, Jr. in a historic election. Rangel's victory inaugurated the first of his seventeen consecutive terms as Harlem's representative to Congress. Straight after entering Congress Rangel was involved in the founding of the far left National Conference of Black Lawyers. In 1968, young people of African descent in America were growing impatient with the slow pace of social change. Despite modest advances brought on by two decades of non-violent resistance, from one end of the country to the other, the cry for Black Power was raised in the midst of a sea of clinched fists. At the same time, this new militant spirit had moved many to don black berets and carry rifles. On street corners in practically every Black community, passers-by heard demands for Nation Time and Power to the People! National Conference of Black Lawyers and its allied organization, the National Lawyers Guild are the U.S. affiliates of the International Association of Democratic Lawyers, once a leading Soviet front, today still dominated by communist and socialist lawyers and legal organizations. In the late 1970s Charlie angel was linked another Soviet front organization, the World Peace Council. The first official World Peace Council conference in the U.S. was the Dialogue on Disarmament and Detente held January 25-27, 1978, in Washington, DC. It was sponsored by a small committee including and World Peace Council Presidium member, Communist Party USA functionary and Amalgamated Meatcutters Union vice-president Abe Feinglass. A luncheon was held to honor World Peace Council president Romesh Chandra , that was attendedby California Congressmen Philip Burton, Don Edwards, Ron Dellums and New York rep. Charles Rangel. W.P.C. delegation members included President Romesh Chandra, KGB Colonel Radomir Bogdanov and Oleg Kharkhardin of the Communist Party of the Soviet Union International Department. n October 1989 the Nicaraguan Sandinista Government announced that they would no longer comply with the 19 month-old cease-fire agreement with the Contras. This had been considered a prime step forward for the "peace process" that was progressing slowly as part of the Arias Peace Plan. A resolution was introduced in Congress deploring the Sandinistas' action. The Senate voted unanimously in favor, but in the House the vote was 379-29. All the 29 Congressmen voting against the resolution were Democrats. The Council for Inter-American Security dubbed these 29 people the "Congressional Pink Caucus" - Rangel was one of the 29. Rangel also helped found the radical Congressional Black Caucus and joined the equally socialistic Congressional Progressive Caucus. On August 6 1993, a rally to commemorate Hiroshima Day was held at the United Nations, Dag Hammarskjold Park, New York. The rally was designed "to kickoff a national campaign to collect a million signatures supporting a Comprehensive Test Ban Treaty, commend president Clinton for extending the nuclear testing moratorium, urge renewal of the Non Proliferation Treaty, urge swift and complete nuclear disarmament." The event was sponsored by the Metro New York Peace Action Council and several other "peace' groups. Speakers included Charlie Rangel Leslie Cagan, of the Cuba Information Project and the Communist Party offshoot Committees of Correspondence, David McReynolds of the War Resisters League, Socialist Party USA and Democratic Socialists of America, Congressmen Major Owens and Jerrold Nadler, NYC Councilor Ruth Messinger (all D.S.A. connected) and NYC comptroller Liz Holtzman - once the employer and political idol of a young Elena Kagan. In 1994 Charles B. Rangel was an initiator of the International Peace for Cuba Appeal, an affiliate of the Workers World Party dominated International Action Center. 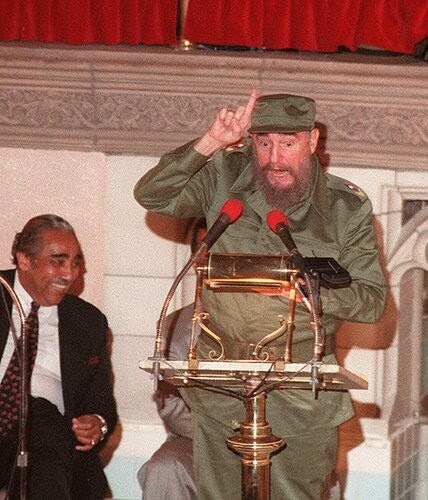 Charles Rangel attended an October 1995 meeting in Harlem to welcome Cuban leader Fidel Castro to New York. H.R. 950, the Job Creation and Infrastructure Restoration Act of 1997 was introduced in the 105th Congress on March 5, 1997 by Congressman Matthew Martinez of California. It had 33 original co-sponsors, including Charles Rangel. The leaders of the Los Angeles Labor Coalition for Public Works Jobs ( Jerry Acosta and Art Rodriguez) and and its only affiliate, the New York Coalition for Public Works Jobs ( Eddie Davis and Bill Davis) , who helped draft the bill were all known supporters or members of the Communist Party USA. Hundreds of thousands of people filled the streets March 22 in a spirited demonstration against the war on Iraq. The huge protest, held just two days after the start of the war, was proof positive that the peace movement – “the other world superpower” – is strong and growing here, one of the sites of the Sept. 11 terrorist attack. Rep. Charles Rangel (D-N.Y.) said “there has been no evidence presented to Congress that Iraq is connected to 9/11. We support the troops but we don’t support the president.” Rangel was flanked by Rep. Major Owens (D-N.Y.), and many other state and city elected officials. Socialism and corruption together in one man. Where have we seen that before? when i was in the navy during the vietnam war all i heard was complaints from guys who were drafted saying i ididn't want to fight this war or i dont want to fight the white mans war. it made me sick to my stomach. now we have a totatally volutary military and its the best way. how would you like to have someone watching your back who says this aint my war? you wouldn't feel very secure and shouldn't trust someone like that. there is nothing but an evil motive to this bill. trust me our military has never been this good and everyone in it joined of their own free will. god bless them all. They all belong to the n.a.a.c.p., the national association for the advancement of communist politicans. Maxine "We're just gonna social..um, ah take over and run your companies" Waters is next on the ethics microcope! Oh happy day! Proof at Last - Richard Cloward was a "DSAer"
Moncrief to File Electoral Charges Against Obama.